Add rice to saucepan. Cover with 1.5 parts of water, add salt and bring to a simmer. Reduce to low heat, cover and allow to cook for approx. 10 – 15 min. until fluffy and cooked through. Remove from heat and set aside. 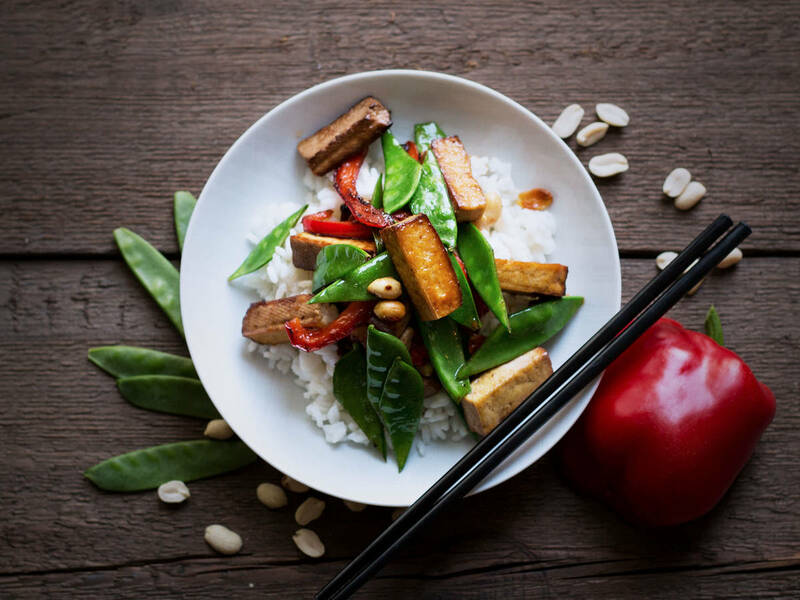 Halve sugar snap peas with a diagonal cut, thinly slice bell pepper, and cut tofu lengthwise into even pieces. Heat some vegetable oil in a frying pan over medium heat. Fry tofu slices on each side for approx. 3 – 5 min. until lightly roasted and crisp. Add tofu, soy sauce, and sweet chili sauce to a bowl. Stir well to evenly coat tofu slices with marinade. Set aside. Add nuts to pan and roast over medium-low heat until golden brown and fragrant. Set aside. Heat some more vegetable oil in frying pan and sauté sugar snap peas and peppers in a pan over medium heat for approx. 5 – 7 min. until lightly roasted. Season with salt and pepper. Add vegetables to tofu and gently stir to combine. Serve with rice. Sprinkle with toasted nuts and, if desired, with fresh cilantro leaves.